You can easily create and share activities for your students to complete in Seesaw. Get inspired with grade level specific activities from our library, or create your own! Free Seesaw accounts can create up to 100 activities, Seesaw Plus accounts can create up to 500 activities, and Seesaw for Schools accounts have access to unlimited activities. 1. Tap the green add button, then select 'Create New Activity' to make a new activity. You can also select or customize an activity from the Activity Library. 2. 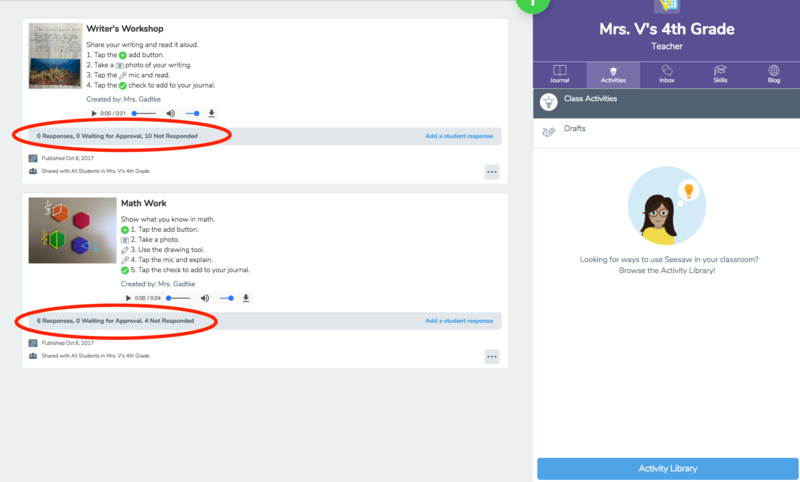 Fill in details of the activity: activity name, student instructions (can include examples and voice instructions), an optional student template, and the student(s) tagged to the activity. Tap 'More Options' to add private teacher notes. You can add Skills or publish your activity to your School library with our our paid product, Seesaw for Schools. 3. Tap 'Preview' to review the activity. 4. Tap 'Share' to publish the Activity. All activities will appear in the Activities tab in Seesaw. Students will tap the Activities tab to see new activities. All student responses will be stored with their name under the activity. As a teacher, you can see who has responded to an activity by tapping the response banner. Family members will only see their child's response to an activity.